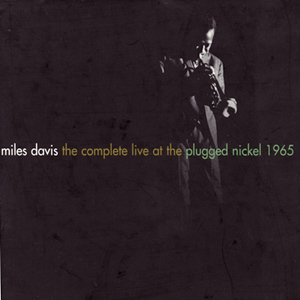 This eight-CD set captures Miles Davis’s second great quintet at its fiercest, loose with both the blossoming of familiarity between the players and the broadness of its attacks on the mostly well known tunes the group called during two nights at Chicago’s Plugged Nickel in 1965. And you can hear it all, from “The Theme” that closed the quintet’s sets to multiple, radically different takes of several tunes. Davis formed this band with just its heated potential in mind, opting for youth in Wayne Shorter’s tenor sax, Herbie Hancock’s piano, Ron Carter’s bass, and, especially, Tony Williams’s unlocked rhythmic energy. It does the mind good when listening to these takes on “If I Were a Bell,” “Stella by Starlight,” and the polarizing “All Blues” and “No Blues” that Williams was under 20 when punching this group’s forward motion. These live shows make clear that Davis was a savvy cat, sticking to the tried ‘n’ true when playing live and then indulging new tunes that eschewed formulaic jazz structures on the string of his new quintet’s explosive studio recordings that began months earlier with E.S.P. (all of them found on the Grammy-winning Complete Columbia Studio Sessions, 1965-’68 box set). But the Plugged Nickel tunes show that familiar or not, these tunes are platforms for scrappy creative apexes when played live. Davis’s trumpet is typically midrange, except when he deconstructs even his own range limitations with squawks and artful miscues. Shorter braves convolutions that tear into his tone, taking his solos far afield from the harmony and melodies at hand only to reshape the tunes. As live jazz, this collection is possibly some of the best in recorded history, adventurous without leaving the ears boxed and powerfully enlightening about where Miles Davis would go in the 1960s.